Last night we had friends for dinner and I always have a theme, so last night it was “A Night in Italy”. I just think it’s more interesting and fun with a theme and you can get really creative with the decor, the menu and your outfit! The menu was simple starting with an antipasto, then we sat for an arugula salad and shrimp marinara with crusty italian bread followed by italian pastries and a dessert cocktail of prosecco with raspberry sorbet and fresh raspberries. All this while listening to Italian music and drinking Italian wines. 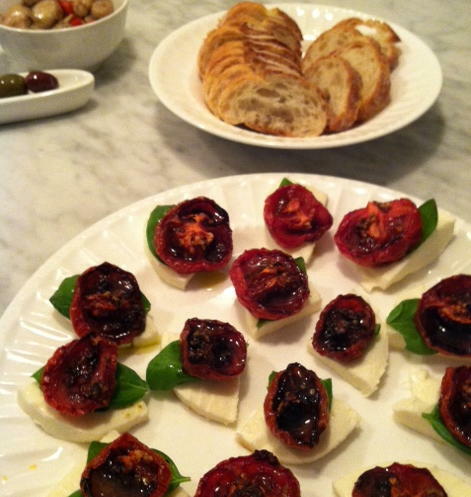 The one hors d’ oeuvre I made last night, that I have made before that is always a big hit is a Roasted Caprese Salad. They fit nicely not just because they are Italian but they are the colors of the Italian flag! I got the recipe from my BFF Karen, who is also my sister-in-law (she was my friend first) and she got the recipe from the Barefoot Contessa. I do not even like tomatoes but I love these and so easy to make. I highly suggest you try them! Preheat the oven to 275 degrees (I do 250 in my oven, because they were cooking too quickly and burning). Arrange the tomatoes on a sheet pan with the cut sides up in a single layer. Mix the olive oil and balsamic vinegar with the garlic and drizzle over the tomatoes then sprinkle with salt, pepper and sugar if desired. Roast for 2 hours until the tomatoes are concentrated and begin to caramelize. Allow the tomatoes to cool to room temperature. Cut the mozzarella into 1/2″ slices, if too big then cut in half and a arrange on a platter. Put a small basil leaf on each piece of cheese then layer with a tomato and drizzle with more olive oil if desired and serve with baguette slices. A great addition to any party…happy eating!